Our Sun is a single star but many stars, probably amounting to about half of all stars have physical companions. It is thought that most stars are formed in groups from huge clouds of gas and dust. We can see this happening in the Great Nebula M42 in the Constellation of Orion seen in the winter sky. The Orion Nebula is a huge cloud of gas and dust extending virtually over the whole area of Orion and some of the surrounding constellations. Material within a nebula is very tenuous but because it covers such an enormous volume there is enough material to form millions of stars. When large stars explode as supernovae they send massive shock waves across vast areas of space. As these shock waves pass through a nebula such as that in Orion, the gas and dust is disturbed and sometimes pushed into clumps. As the atoms in the nebula move closer together gravity begins to draw them ever closer to each other. As more material accumulates the gravity increases and even more material is pulled in. When a clump in the nebula has grown sufficiently, the enormous temperature and pressure in the centre causes nuclear reactions to begin and a star is born. When the stars first begin shining they are generally very powerful and blow away much of the gas and dust left over from the original nebula, leaving the group of new stars. The group called The Pleiades M45 in the constellation of Taurus is one such group that still has traces of the gas surrounding the stars. Over millions of years these groups may break up as the stars drift apart. Our own star, The Sun, almost certainly was formed in such a group but because so much time has passed there is now no indication of which stars were the Sun's siblings. Let us just consider some types of groups of stars. Many stars can be seen to be doubles, some with the naked eye, some only using telescopes. Some of these stars are actually associated, that is they are revolving around each other just as the Earth and Moon do, only much further apart. It is most likely that they formed at the same time in the same nebula. Some stars like Mizar, the middle star in the handle of the plough (Ursa Major) have a naked eye companion Alcor but when viewed through a telescope another star can be seen close to Mizar making this a triple system. That is not the end of the story, when the light from the Mizar pair is broken up using a Spectroscope the pair each have a companion too close to be seen with any telescope, this makes it a five star system. There is another type of double where the stars are not associated but are just in the same line of sight as viewed from the Earth. Some are actually further apart from each other than the first one is from us. One of the most spectacular doubles of this type is the star Albireo b Cygnus. One component of the pair is golden yellow and the other is a dazzling blue. These are clusters of stars that formed as a group from the same huge cloud of gas and dust. There are many of these Open Clusters with numbers of stars varying between a few tens to many thousands. 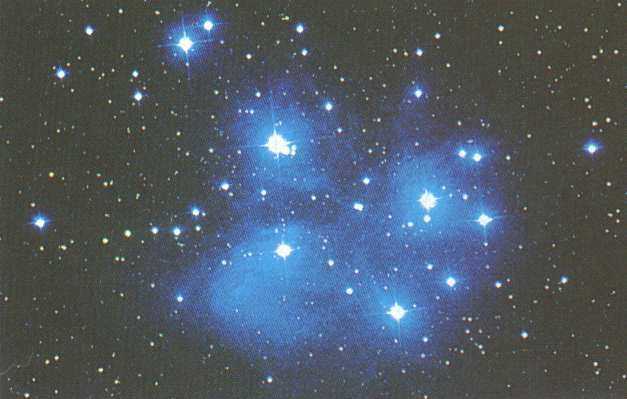 The Pleiades in the constellation of Taurus is one of the closest and therefore brightest The Pleiades has seven bright naked eye stars from which the name 'The Seven Sisters' is derived (see the picture above). 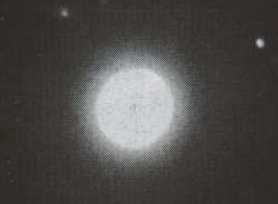 The group may actually contain up to 500 stars many of which can be seen when the cluster is observed using binoculars. 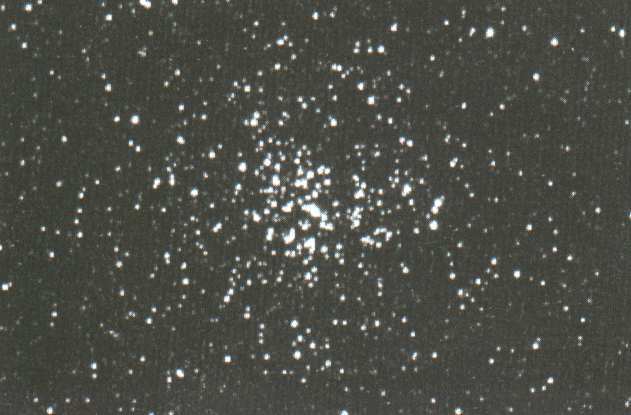 Some of these open clusters are quite sparse and appear only loosely grouped. As the cluster gets older the stars drift apart until the association is lost completely. The Pleiades is less than 10 million years old and still retains what might be remnants of the original nebula in which it formed. A cluster can be seen forming in M42 the Great Nebula in Orion. A group of four bright new stars, less than 1 million years old, is illuminating the nebula. The four stars are known as the trapezium but they are only the brightest on hundreds of stars forming in this cluster. 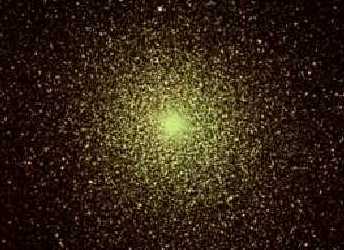 Globular Clusters may in some cases look similar to Open Clusters but they are in fact very different. Open Clusters are formed within the main spiral form of our Milky Way Galaxy (More about Galaxies next). Globular Clusters are found in a halo around the main part of the galaxy above and below the main spiral shape. These cluster do orbit the centre of the galaxy but not in the main disc, their obit are set at an angle to the main disc. There are about 100 known and are comprised of between a few thousand and a few million stars. The brightest from our country is in the Constellation of Hercules and is known as M13. The stars in Globular Clusters are very old, possibly as old as the Galaxy itself. We can tell they are old by studying their size and colour. They are also made almost entirely of Hydrogen with hardly any of the heavier elements found in the stars of the main spiral. Heavy elements are formed in stars and are distributed into space when a star dies as a supernova or a planetary nebula. These heavy elements mix with the gas in the nebulae and become part of new stars as they form from the nebula. As the stars in globular clusters have virtually no heavier elements they must be first generation stars which formed before other stars had produced the heavier elements. Like the Milky Way many galaxies have spiral arms. Some have arms like curved spokes in a wheel some gently curved some tightly curved. Others have what looks like a straight bar of stars extending out from the central ball with the spiral arms attached to ends of the bar, these are known as Barred Spiral Galaxies. 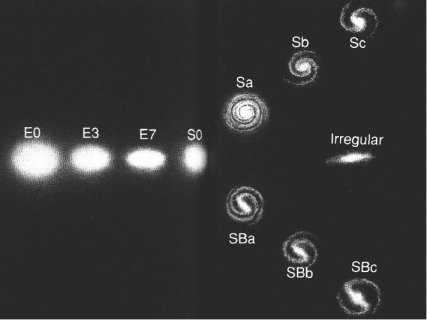 Spiral galaxies are classified as A, B or C depending on how tight the arms are wound, preceded by S for Spiral and Sb for barred. e.g. SA or SbC. On the edges of the arms regions of star formation are found. These regions are rich in young bright blue stars whereas the central bulge is composed of mainly old red stars. 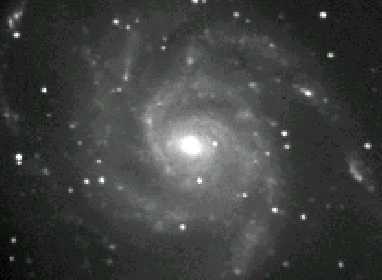 Spiral galaxies are usually quite large, our galaxy The Milky Way , is about 100 thousand light years across and contains about 200 billion stars. Our Sun is about 30 thousand light years from the centre. These are huge balls of thousands of millions of stars. They do not have spiral arms but are elliptical (egg shaped). Many of these Elliptical Galaxies are the largest of all star groups, some having billions of stars. Elliptical Galaxies are classified according to how flattened they are nearly round ones are known as E0 and sausage shaped ones E4. Many giant elliptical galaxies at the centre of groups of galaxies and bind the group together with their powerful gravitational force. There are active elliptical galaxies that have super massive black holes at their centre which are devouring huge quantities of gas, dust and even stars. The energy released by the material being torn apart by the black hole is channelled into huge jets stretching millions of light years from the galaxy. These galaxies are as the name implies large groups of stars but with no classifiable shape, in other words they may be any shape. Our Milky Way Galaxy is one of the two main galaxies in what is known as the Local Group comprised of about 12 associated galaxies. Our spiral and the other spiral known as M31 or The Great Andromeda Spiral, have smaller irregular galaxies associated with them as satellite galaxies. Two of ours can be seen from the Southern Hemisphere as islands broken off the Milky Way and are known as the Magellanic Clouds. Although we say these are small galaxies the may still contain many millions of stars. 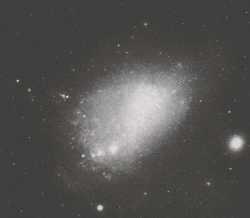 There are many other small irregular galaxies in our local group of galaxies.